Northern Virginia Criminal Justice Training Academy - Rinker Design Associates, P.C. RDA has provided professional civil engineering and surveying services for several projects at the Northern Virginia Criminal Justice Training Academy, and the Prince William County Public Safety Training Center located in Nokesville, Virginia, on a 93-acre site. The project scope for a new Emergency Vehicle Operations Center included the review of the Master Plan and participation in several design meetings with staff members from Prince William County, Prince William Police Department, the Northern Virginia Criminal Justice Training Academy, and other consultants to develop a final site plan. 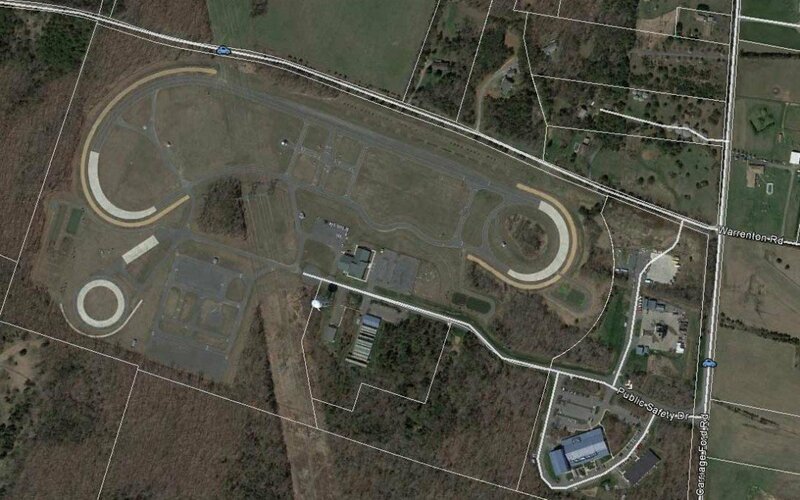 The final plan included the design of a 1.2-mile highway response course, an urban training course, an intersection training area, a skid pan and wet track, as well as a classroom training building and associated parking and utilities. A water recycle system was designed to recapture the water pumped onto the skid pan and the wet track. Three stormwater management facilities were designed for this site: one enhanced extended detention dry pond, and two dry ponds. One of the challenges of this project was to minimize impacts to the wetlands and a Dominion Power transmission easement without compromising the ability of the police to effectively conduct training exercises. The site plan submittal consisted of grading plans, utility profiles, landscape plans, and erosion and sediment control plans. All easements required by this development were platted by RDA’s Survey Department. RDA also provided site work specifications for the project and assisted with bidding and construction administration services for the project. RDA provided professional civil engineering and surveying services for the Prince William County Fire and Rescue Department for the development of a Trench Simulator Facility for trench rescue training at the PWC Public Safety Training Center. The project scope included the design coordination with the structural engineer and PWC Fire and Rescue staff, and development of the final site plan (including grading and erosion control plans). RDA provided site work specifications for the project and bidding and construction administration services, including periodic site visits and final punchlists for the project. RDA also provided professional civil engineering and surveying services for the NVCJTA Training Pad / Modular Building. Rinker Design Associates provided construction plans for a 23,000-square-foot modular building and a 40,000-square-foot training pad for the Northern Virginia Criminal Justice Academy. Design elements included extension of an access road to the training facilities, site drainage, design of an oil grit separator for the training pad use, a stream analysis, stormwater management design, and erosion and sediment control plans. RDA also provided construction quantities, bond escrows, and assistance during construction.